Larkin Dance Studio occupies the armpit of a run-down strip mall. It’s wedged between a tanning salon and a pet store, which means it smells like baked flesh and soiled woodchips. Odors aside, it ranks among the nation’s best dance studios. Back in the day, Larkin propelled Nathaniel Eric Richert to great fame. Who’s Nathaniel Eric Richert, you ask? Harvey Kinkle, of course! Who’s Harvey Kinkle? Anyway, I had the privilege of dancing at Larkin for many years, despite my own lack of flexibility and rhythm. While I bumbled around like a newborn hippo, competitive dancers leaped and twirled in perfect unison. I yearned to dance among them, to kick like a Rockette and to pirouette without vertigo. I wanted to wear the sequined, form-fitting costumes, the false eyelashes, and the wig with bouncy ringlets. At the annual recital, I had that chance. It was the spring of 1995 and I had gained mastery over a 3-minute jazz routine. I had the sequined costume and lashes, but no wig — mom and dad decided it would be cheaper to produce ringlets by rolling my hair in curlers. Same for Ann, my big sister. The night before the performance, mom segmented our hair and rolled each locket into a curler. Ann and I slept in the curlers and wore them to school, bearing the shame of looking like 1950s housewives for the prospect of bouncy, glossy curls. Who knew, maybe we’d be cast for a role on Sabrina, the Teenage Witch! Shortly before the recital, we removed the curlers. It wasn’t Harvey Kinkle who wowed the audience that evening. 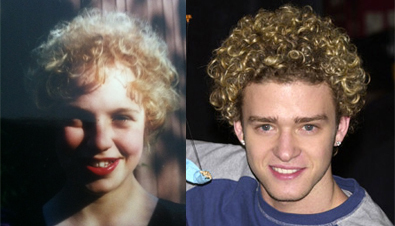 It was Justin Timberlake and Corey Matthews. Ahahahaha oh my goodness. SO CUTE.